FRDM Fest is a festival of the people, held by the people, for the people. This event is about bringing dreams to reality while doing what we love. Using our background in events, we've decided to make this 4th of July weekend about more than just a celebration. This 4th of July, we want to #PartyWithAPurpose. Hosted on the waterfront events park of the Queen Mary, we're blending the elements of a great 4th of July BBQ with an eclectic lineup of today's music. 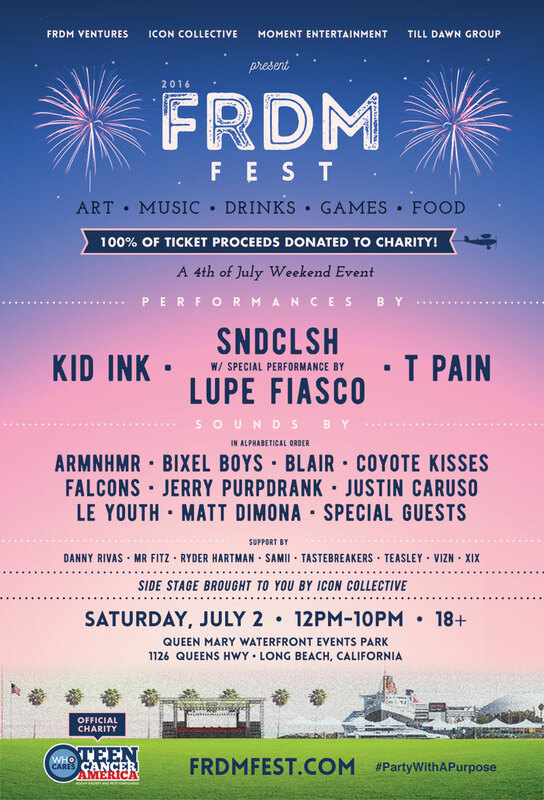 All the proceeds from FRDM Fest will be donated to Teen Cancer America, a non-profit organization dedicated to improving the lives of teenagers and young adults with cancer. So join us this July 2nd and help us reach our goal of $15,000 donated to Teen Cancer America! Roger Daltrey and Pete Townshend of The Who are the driving force behind Teen Cancer America. After over a decade working with Teenage Cancer Trust in the UK, the duo decided to bring their passion across the pond and make a difference in the lives of teens and young adults with cancer in the United States. Teen Cancer America partners with hospitals to create youth-oriented centers for those receiving treatment. These units provide peer support and interaction while receiving treatment at in-patient and out-patient clinics. For all table inquiries please contact nikhil@youarethemoment.com. Limited supply only. Line Up / Set times subject to change. Everyone subject to search upon entry. Venue security has the right to ask you to leave the venue at anytime with no refund. Venue parking is $20 a day. Uber/Lyft drop-off is at the REEF drop off: 880 S Harbor Scenic Dr, Long Beach, CA 90802. There will be traffic, we strongly recommend CARPOOLING! Yes, we take Cash and Debit. There will be a First Aid tent, but please, be careful. There are no water refill stations. Festival Map will be posted online. Set times will be released the day before the event. No, your Medical Marijuana Card is not valid at FRDM Fest.